When creating an Infor CRM bundle manifest recently, I needed to include new roles and secured actions. 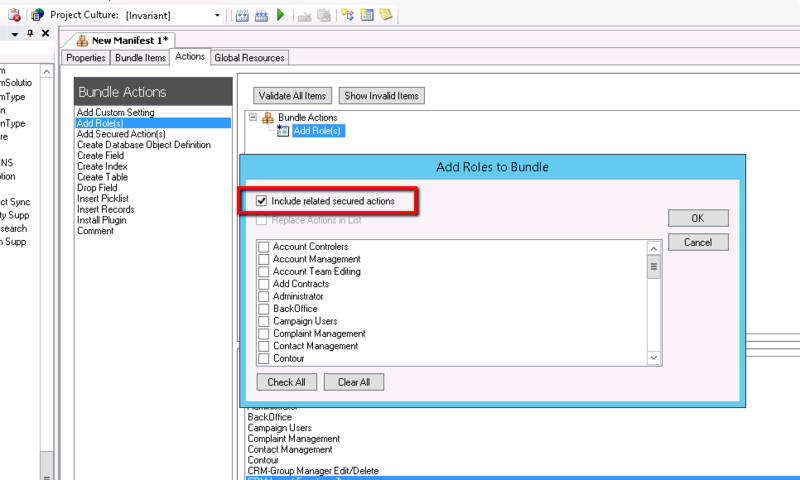 In the bundle actions area of a new manifest, there are options to add Role(s) and to add Secured Action(s). When adding roles, there is an option to “Include related secured actions”, however selecting this options does not actually add the related secured actions. While it is a bit of a pain that this option doesn’t seem to work, there is an easy “fix”. When creating bundle manifests, be sure to add any needed secured actions yourself along with any Roles you need to add.